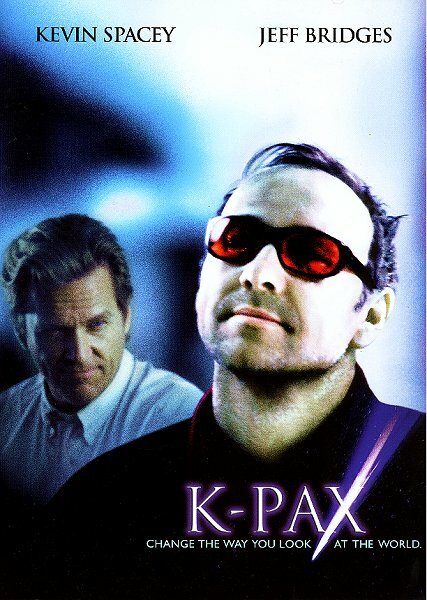 The 1995 novel by Dr. Gene Brewer becomes this ONEderful movie called K-Pax from director Iain Softley. After a mugging incident at New York's Grand Central Station, Prot (Kevin Spacey), a man who claims to be an alien from the planet K-PAX, is turned over to a public mental hospital and the care of Dr. Mark Powell (Jeff Bridges). When medication fails to alter Prot's insistence that he is visiting from another world on a fact-finding mission, Powell gets more involved with his patient, who seems to have a calming effect on the other residents of his ward. At first convinced that Prot is a delusional who can be treated, Powell begins to wonder if his bizarre patient's story is true, particularly after the hospital's doctors find that Prot possesses the baffling ability to see ultraviolet light. As the date grows nearer when Prot claims he must leave Earth (a "class BA-III planet"), Powell becomes increasingly concerned that a psychiatric breakthrough must occur by then. K-PAX (2001) co-stars Alfre Woodard and Mary McCormack. He says we have 10 planets in our solar system. When he is given a command'have a seat' he finds it stangs to hear and does not sit down. 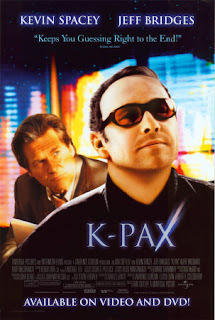 They have no marriges in K-pax and a child is everyones child and learns from everyone, basically a tribe.